This custom-built church information center was designed to fit a specific space, working beautifully and naturally to enhance the existing building layout. 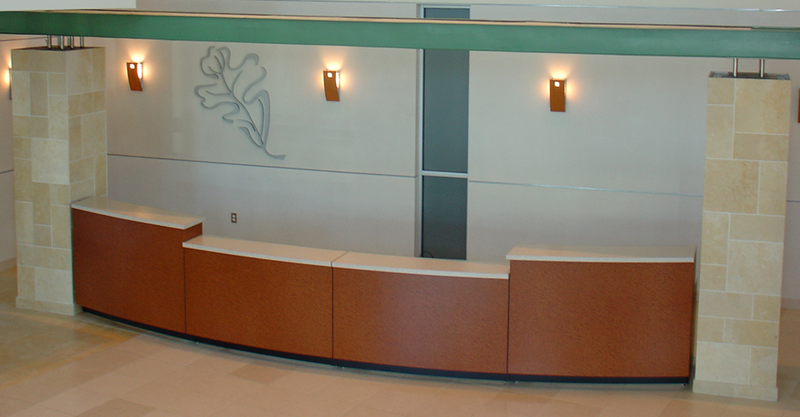 Available in multiple lengths, this classy desk will work well to enrich your specific welcome center design. The front is gracefully curved, while the center section is artfully constructed with a two-tier cabinet top to provide the uttermost welcoming accessibility. The back side is simply designed as an open, airy space with no cabinets or drawers, offering plenty of room and comfort. This 20 foot cabinet can be purchased for $14,500. This 2 tier information booth cabinet is open underneath and has no doors and drawers. 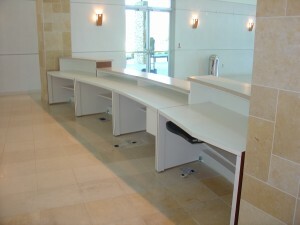 There is a 30″ high counter top on the back side. The front sides are 42″ high on the outside edges and 36″ high in the center. and includes delivery to anywhere in the contiguous United States. A 15′ information center consisting of one lower section and two higher sections would cost $11,000 and includes delivery to anywhere in the contiguous United States. A 10′ information center in this style would cost $7500 and includes delivery to anywhere in the contiguous United States. A 5′ information center in this style would cost $4000 and includes delivery to anywhere in the contiguous United States. All prices are subject to change with out notice. Please call to confirm price.